Second set of railings (different style) also available - see later in this thread. 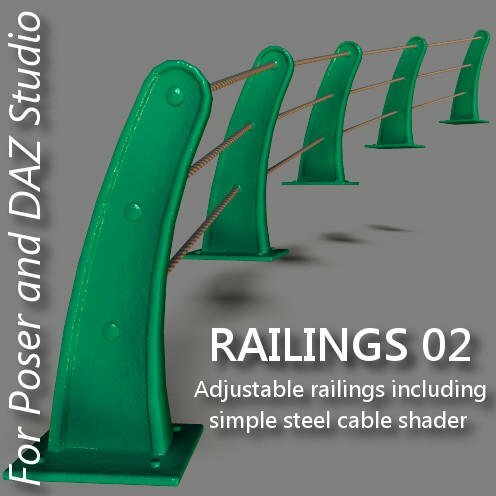 A set of four simple railing props for Poser and DAZ Studio that can be connected together to form a variety of larger railings by simply parenting Y rotating, and X/Z translating. and three 'ages' (new, old, and repaint). The ZIP contains THREE main folders: Runtime, Runtime (Extra DS Files), and DS Content. Poser users only need the first, DS users need all three. See the readme for more details. Here's the simple shader I used (Poser version). The DAZ Studio Shader-Mixer-generated version is more-or-less the same, but I've put the main parameters onto the surfaces tab (and kept all the usual ones!). 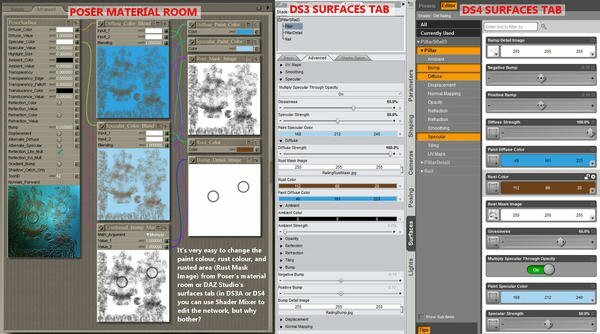 So you don't need to open shader mixer to change paint colour, rust coverage, etc. Excellent props, and a lot of work went into these, thank you very much. 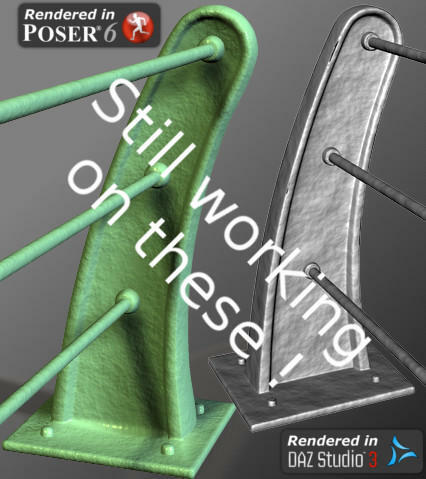 It is great to see something like this with shaders for both Poser and DAZ Studio, thanks again for taking the time to do it. My pleasure - it was fun creating them! I'm a 50/50 Poser/DAZ Studio user, so I like trying to make stuff that works equally well in both. But the fix should be quite simple, just a couple of morphs in the PP2s. I've started work on the morphs, and I'll post back here when the fix is ready. Thank you, that will be interesting. After trying various approaches I'm going for a separate 'Morphing Rail Section' (or something like that) prop that looks identical to the existing 'Pillar And Rails' prop when it loads, i.e. a single pillar with three rails sticking out of the side. 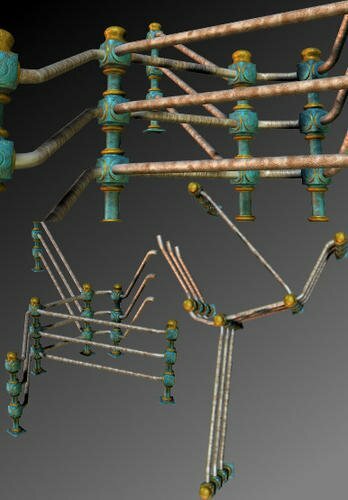 The only change from the 'Pillar And Rails' is that I've added a couple of extra edge loops near the ends of each rail, and I've added some morphs to bend the rails in a few different ways (e.g. Slope Up, Offset Left, Bend Right 90). Anyway, here's where I'm up to - attached image shows six 'Morphing Rail Sections' with different morphs applied, translated and rotated to roughly fit together (three renders of the same railing from different viewpoints). Hmmm... adds another dimension to the railings, literally! Testing seems fine (not perfect, but good enough I think). Finalizing the rules of thumb for combining morphs now. Release should be later today (it's 10am here). 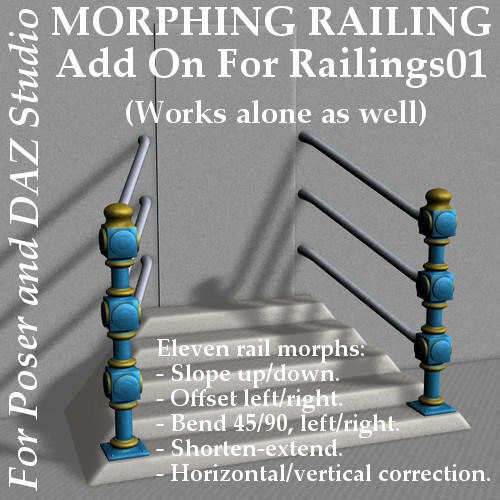 Morphing Railing uploaded separately to ShareCG and Rendo Freestuff. 1) Slope morphs should work okay together with either Offset or Bend morphs, although the rails may look a bit flattened from some angles. You shouldn't need to use the correction morphs. * Same sign for Offset/Bend Right or Slope Up, opposite sign for Offset/Bend Left or Slope Down. 3) If you follow these rules of thumb and it still doesn't look right, fiddle with the correction morphs until it does! Thanks, I'll try it a bit later on. It is a great addition to the set. Thank you. The morphs make it exceedingly useful. I don't think I've run across any type of fencing that has that capability. Kudos! Nice to know people are finding them useful - in fact, that's enough incentive for me to try making an alternative set, still a WIP at present. Note: for these test renders I applied Smooth Polys (Poser) / SubD (DAZ Studio). The railing's not yet UV mapped so I've just set diffuse and specular colours and added a procedural 'Clouds' texture to the bump channel - that's all. Second set of railings are now available on ShareCG and Renderosity Freestuff. Same principle as the first set but I've tried a slightly different approach to the Rail Adjustment morphs. 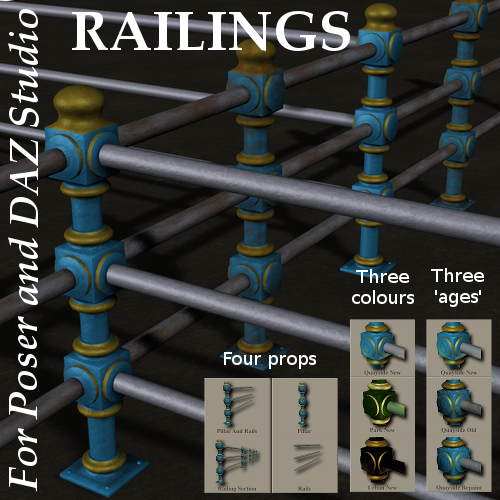 I've also included a 'Single Rail' prop to give an alternative way of making railings. More info on the ShareCG page (and in the readme if you download). The textures are procedural, so no texture images included (although everything's UV mapped and there's a texture template included). The steel cable shader is quite temperamental, but with a bit of fiddling it can look quite good - the render in this post was done in DS3 using the shader in the freebie (plus that post gives a bit more info about the shader). Thank you for this. I used two single railings as steel cables for a construction crane tower in my current art scene.